Definition at line 400 of file DerivedTypes.h. Definition at line 414 of file DerivedTypes.h. Definition at line 580 of file Type.cpp. 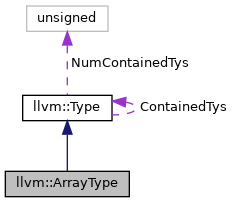 References llvm::LLVMContextImpl::ArrayTypes, assert(), llvm::Type::getContext(), isValidElementType(), llvm::LLVMContext::pImpl, and llvm::LLVMContextImpl::TypeAllocator. Referenced by appendToGlobalArray(), appendToUsedList(), collectFunctionUsers(), llvm::SanitizerStatReport::create(), llvm::createHWAddressSanitizerPass(), createLoweredType(), createPrivateNonConstGlobalForString(), llvm::createShadowStackGCLoweringPass(), dump(), FunctionNumber(), getArrayElements(), llvm::ConstantDataArray::getFP(), llvm::ScalarEvolution::getGEPExpr(), getMemSetPatternValue(), getOrInsertGlobal(), llvm::ConstantDataArray::getRaw(), getRetComponentType(), getTypePartition(), INITIALIZE_PASS(), instrumentMaskedLoadOrStore(), isCallPromotable(), IsInterestingCmp(), isKnownTypeIdMember(), LLVMArrayType(), LLVMConstArray(), needsRuntimeRegistrationOfSectionRange(), OptimizeGlobalAddressOfMalloc(), parseOptionalLinkageAux(), PushArgMD(), removeGlobalCtors(), llvm::SanitizerStatReport::SanitizerStatReport(), scalarizeBinOpOfBuildVectors(), selectJumpTableArmEncoding(), setCoroInfo(), setUsedInitializer(), shouldKeepInEntry(), simplifyAllocaArraySize(), StackMallocSizeClass(), switchToSelect(), TypeSizeToSizeIndex(), and llvm::InstCombiner::visitLandingPadInst(). Definition at line 592 of file Type.cpp. References llvm::Type::isFunctionTy(), llvm::Type::isLabelTy(), llvm::Type::isMetadataTy(), llvm::Type::isTokenTy(), llvm::Type::isVoidTy(), and llvm::Type::VectorTyID.